After a week of voting the practice time poll has now closed. It's time to share the results with you all. 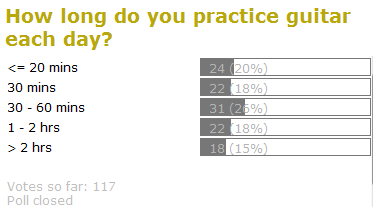 As the graphic below shows 30 to 60 minutes a day is the most popular amount of practice time. That's pretty respectable so congratulations to all of you. A surprising (for me) number of voters spend over an hour, and even over two hours on practice each day. But that's the great thing about polls, I get to discover surprises like this and learn more about you, reader. A few of us (I put my hand up here) admit to 20 minutes or less a day. Of course more time would probably benefit our playing, but for most of us playing is not the only thing in our lives. Still, I'm happy knowing that even only this much practice each day brings improvement. I wonder what the correlation is between how long we practice and how long we have been playing... I'm in the 2+ hours a day and have only been playing for around 3 months. Yes. In my opinion, the problem is not the time spent, but how the time is spent. For example, yesterday a I played less than 1 hour and learned a lot. Today I played for almost 4 hours and...development = 0. Hi Lucas, good point. Quality and quantity are important.